We only lived in Woodbridge, New Jersey, from 2000-2002, and were so spoiled with the convenience and variety of Indian restaurants in Middlesex County and nearby Manhattan (census data ranks these areas first and second, respectively, with the highest Asian Indian population in the the United States). Although we have moved to two different states since then, we have returned regularly to New Jersey to visit and stay with our Indian friends in North Brunswick and Somerset. They have been hospitable as always and generous in feeding us our favorite Indian foods! Highlander especially likes kheer because his Mum used to make rice pudding for dessert when he was growing up. Kheer is India’s version of rice pudding; it is made with exotic and expensive spices, such as cardamom and saffron, and has a distinctively rich, sweet and flavorful taste. 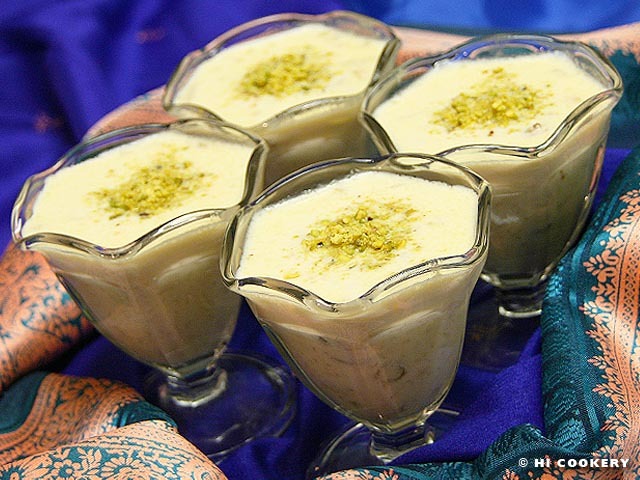 Indulge with Indian rice pudding and cook kheer for National Rice Pudding Day! Wash the rice until the water runs clear. Drain the rice well. In a large pan, melt the butter on low heat. 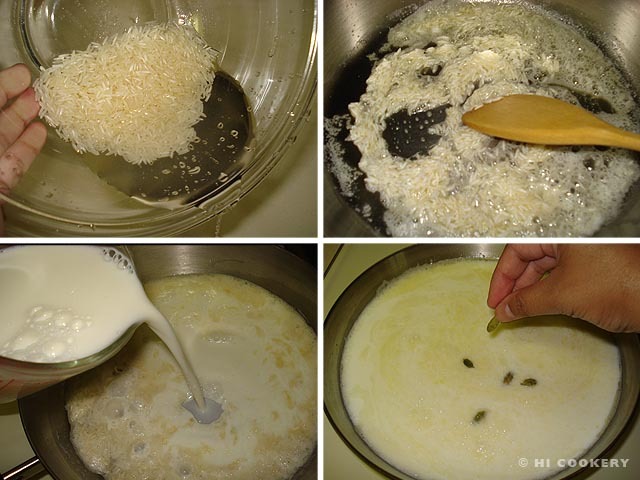 Toast the rice in the melted butter by stirring it for about two minutes. Pour in the milk and bring to a boil, stirring constantly so it does not burn. Lower the heat to simmer the rice mixture. Add the cardamom pods. Stir in the sugar until it dissolves. Cook the rice mixture for about 30 minutes on low heat until the rice becomes soft. Stir often to break the thin film that develops over the milk. Add the almonds and pistachios. Add the raisins and a pinch of saffron. Cook for another 10 minutes, stirring constantly. Remove the pan from the stove top. Pour the rice mixture into a glass container. Discard the cardamom pods. 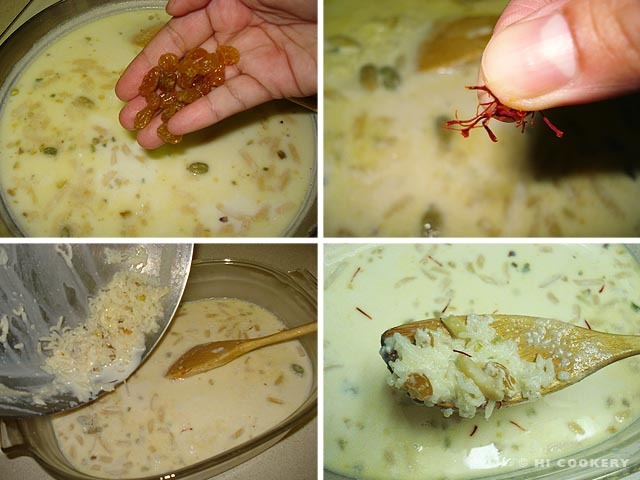 Let the kheer cool at room temperature. Cover and refrigerate for at least an hour to add firmness to the rice and allow the flavors to blend. 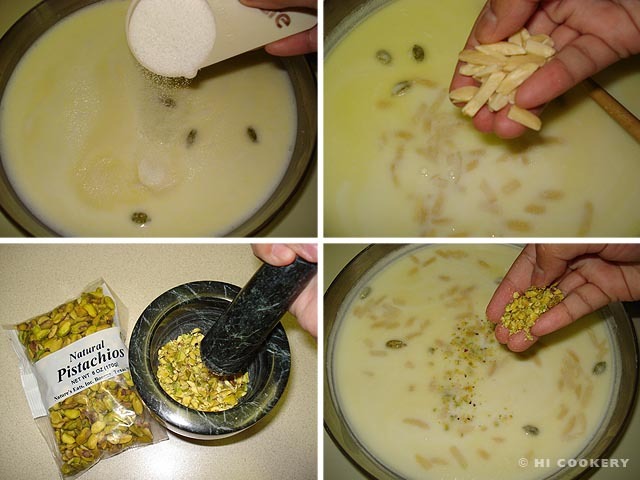 Serve in dessert cups or bowls and sprinkle ground pistachio nuts on the top as a garnish. Thanks to Lisa L. for sending the saffron from Spain.